This is another kind of pitlai in which we use garbanzo beans instead of groundnuts or peanuts. Here is the receipe..
Soak the garbanzo beans for a minimum of 8 hours. Pressure Cook it and keep it aside. Also pressure cook toor dhall with a pinch of turmeric powder in it. Keep it aside. Take a small pan, pour a drop of oil, preheat it and fry coriander seeds, channa dhall, coconut, red chillies, asafoetida, to golden brown and let it cool. Grind it in to a fine paste. Now take a wide pan, put the eggplants (brinjal) adding tamarind, turmeric powder, sambar powder, salt and a cup of water and let it cook for 6 mts. When it is half done add the cooked garbanzo beans to it and let it cook for another 3 mts. Now add the coconut paste to it and let it boil for another 2 mts. Now add the cooked toor dhall and let it cook for another3 mts. Pitlai is done. Take a small pan, pre heat the oil, add mustard seeds, when it splutters add fenugreek seeds, curry leaves and asafoetida powder and fry it till golden brown and pour it into sambar. Try this and lemme know your comments. 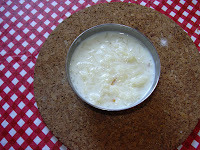 In our family, we make this paruppu payasam or paruppu kanji along with idly on sivarathri night. This will be our palagaram on that day for all of us from small kids to big aduts. Here is the receipe of paruppu Kanji..
First roast the moong dhall for 2 to 4 mts until it turns to a light pink color. Then pressure cook the moong dhall with 2 to 3 cups of water. Mash the dhall finely. Now add cardamom and jaggery to it and let it boil till the raw smell of jaggery disappear. Now add the milk and let it boil for another 5 mts. Now paruppu kanji is ready to serve. We can also add a tablespoon of cooked channa dhall along with moong dhall. If you want to garnish it, then roast cashews in a drop of ghee, till golden brown and pour it on top of this kanji or payasam. First take the raw tamarind (its better to use raw tamarind instead of tamarind paste), green chillies, jaggery and salt and grind into a fine paste. Do not add water while grinding. Now we can follow two ways of making this inji-puli. One is just mix the chopped ginger to the above paste and mix it well. Let it soak for a day. We can start using this as a pickle from the next day. Other method is, take a pan, preheat a teaspoon of sesame oil, add mustard seeds when it splutters add the grinded paste to it with half cup of water and let it boil for 5 to 7 mts. Turn off the stove and put the ginger pieces on top of it and mix it well. Let it soak in the tamarind paste overnight and can be used the next day. The above said quantity can be used for a week. First pressure cook the toor dhal and keep it aside. Take a pan, put the finely chopped tomatoes into it add a cup of water, turmeric powder, salt to taste, pepper powder and 1 green chillies to it and let it cook for 7 mts. When the tomatoes are finely cooked, add the toor dhall to it. Also add the required amout of water to it. Turn off the stove when foam starts coming out of rasam. Take a small pan, pre heat the oil and ghee, add mustard seeds, when it splutters add fenugreek seeds, asafoetida powder and remaining green chillies to it and fry it till golden brown. Pour it on top of Rasam. Garnish it with coriander leaves. Crystal salt (kal uppu) - acc to taste. Take a dry pan, fry toor dhall, urid dhall, red chillies, coconut and crystal salt to golden brown without adding oil. Then fry garlic for 2 mts. Let everything cool and grind it into a fine powder. This may not come as a fine powder, still it is ok. Now add this powder to rice adding sesame oil to it.